Hope you all are having a happy week end. I’m going to share some DIY hair masks with coconut oil that helps to maintain your hair’s health. Winter is here and our hair gets all damaged and frizzy. Silicone filled hair masks will give only temporary results. In order to treat our hair we must incorporate oils and butters in our hair care routine. 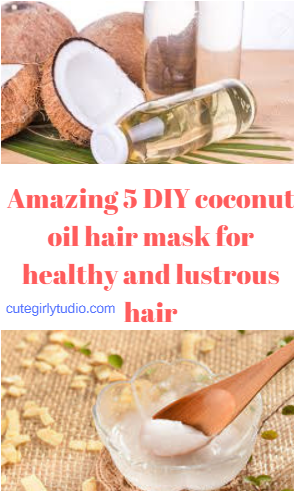 So I came up with this 5 DIY hair masks with coconut oil. I will try to post hair masks with butters and various other oils. If your hair is dry and damaged then this simple mask is your savior. I personally have dry hair and I use this mask whenever I want to deep condition my hair. Take coconut oil in a bowl and melt it using double boiler method. Now add mayonnaise and honey to it. Mix it really well until all the ingredients are evenly mixed. Apply this mask all over your hair and scalp then leave it for about 1 hour to 1.5 hours. You can also use hot towel to steam your hair. In that way you can double the benefits of this hair mask. Then wash it of with your regular shampoo and conditioner and welcome your smooth and soft hair. Many think that we should not use oils if we have dandruff issue. But trust me girls organic and virgin coconut oil removes your dandruff. Take thick yogurt in a bowl and the add lemon juice to it. Mix it well until thick paste is obtained. If you use yogurt that is runny then you will have tough time while applying. So use thick yogurt. Now add melted coconut oil to the curd and then mix it well. Apply this mask all over your hair and scalp then leave it for about 1 hour to 1.5 hours. You can also use hot towel to steam your hair. In that way you can double the benefits of this hair mask. Then wash it of with your regular shampoo and conditioner . Use this mask once a week and you will notice reduction in dandruff within few uses. There are times when girls try hard to grow their hair. Hair growth is natural and one cannot grow their hair overnight. But one can stimulate their hair growth rate. This hair mask accelerates your hair growth and improves your hair length and density. You can also use fresh amla, hibiscus flower and fenugreek seed. In that case blend the amla, hibiscus flower and fenugreek seed in a blender and use the paste instead of individual powder. Take amla hibiscus powder and fenugreek seed powder in a bowl and mix them evenly. Now add melted warm coconut oil to this and mix them until smooth paste is obtained . Let this mixture rest for an hour. Now apply this mixture all over scalp and hair. Leave this for 1.5 hour to 2 hours. Then wash it with regular shampoo and conditioner. Use this once a week regularly to notice huge difference in your hair length and volume. This hair mask is extremely helpful in controlling hair fall. It is impossible to treat split ends. But we can prevent it if we follow good hair care routine that suits your hair. Dehydrated hair is prone to split ends. So it is important to moisturize our hair. Take a fresh aloe vera leaf and scoop out the gel. Now blend this in a blender. Take 1 spoon of aloe vera gel and store the rest in fridge for later use. Now add 2 spoons of coconut oil to the aloe vera gel. Mix them well . Now apply this to the ends of your hair. Leave this overnight and then wash it with regular shampoo and conditioner. Follow this every time you wash your hair. You can prevent the split ends to great extent. If your hair is weak and prone to breakage then this hair is for you. This hair mask makes your hair stronger and healthier. Take 1 egg white in a bowl and beat it until it is frothy. Now add coconut oil and beat it well. Now add fenugreek bowl and mix it well. Now apply this all over scalp and hair and leave it for about 1 hour. Do let me know if you guys like this or not.